To call this a coming of age story is an understatement. To call this one of the most unique movies I've ever seen is even an understatement. 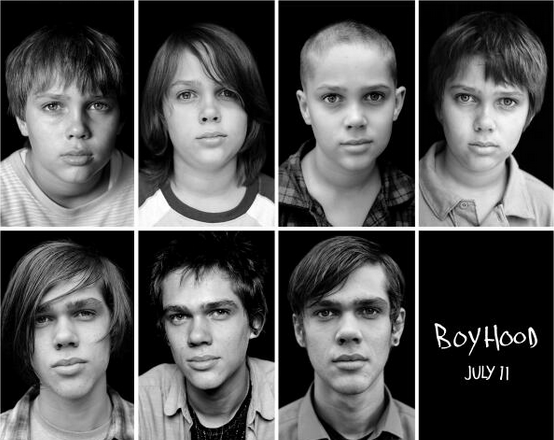 I'd never heard of a concept quite like the film "Boyhood." Production began in 2002 and was completed in 2013. We follow a boy and his family from the time he is 6 years old until he leaves for college. By the end of the film, they genuinely feel like family to us. It seems unreal in Hollywood that the same cast was attached to this project for 11 years and filmed a few weeks each year. The reason this film is so enthralling is because it isn't sensationalized - it's totally relatable. The dialogue is nothing special, yet that's also what's so special about it. If you read no further, at least watch the trailer below. I'm covered in goosebumps each time I do! The majority of the film takes place in Houston (yee haw! Texas loves Texas!). I loved hearing music throughout the years - "Soak Up The Sun" to "Soulja Boy" to "Somebody That I Used To Know" all reminded me of where I was when those songs were popular. I'm not so sure that Ellar Coltrane, who stars as Mason, had aspirations to be an actor - not that he needed them. He was pretty one-note and emotionally monotone throughout the film, but what a DOLL! How did director Linklater know he would turn out to be such a cutie? I would have watched his story until he was 50. Both Mason and his sister Samantha (Lorelei Linklater, daughter of the writer/director) do a nice job of not over-acting. These characters seem so lifelike. I did have a hard time believing that some of the hardships they went through as children didn't affect them as teens/young adults. Or at least, they hadn't yet. Props to Ethan Hawke and Patricia Arquette, two actors I wasn't a huge fan of before now (though Linklater is clearly a big fan of Hawke, having worked with him on the "Before Sunrise" trilogy.) As Mason's divorced parents, they both give honest and touching performances. Hawke's "fun dad" vibe is totally matched by Arquette's "desperate to do what's best for my family" mom. The film shouldn't necessarily be called "Boyhood" - "Parenthood" and "Familyhood" are also very appropriate titles. The tumultuous things the family goes through aren't exaggerated or too fantastical - it's stuff we all could face. Two abusive relationships, bullying at school, struggling to pay the bills, day-to-day conversations like ones I've had thousands of times with my friends and family. Following in the same footsteps as "Chef" and "Life Itself", this is one of the best movies of the year. NC Competition Dining : Cook Like a Chef!